By my count, the difference between John Boehner's new cuts and Harry Reid's plan is only $5 billion in domestic spending reductions over 10 years. Five billion. That's 0.6% of the discretionary cuts in discussion. That's' 0.1% of this year's nearly $4 trillion budget. That's 0.06% of the decade's $9 trillion debt burden. If this debate is truly about reducing spending, then the debate is over. But the debate isn't over. Because it's not just about spending. 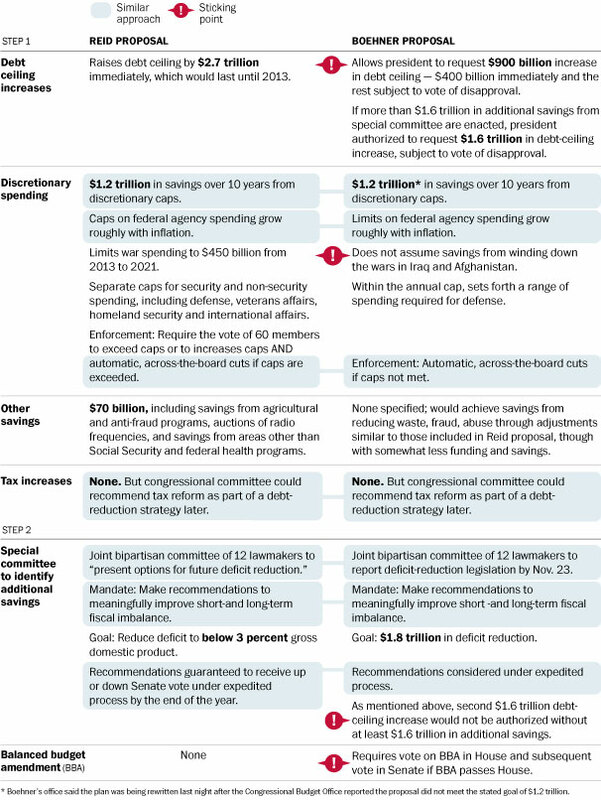 There are two remaining sticking points in these budget discussions (to see the full overlaps and sticking points, see this Washington Post graphic prepared by Rosalind S. Helderman and Laura Stanton I've included at the bottom of this piece). First, there is the debt ceiling. Boehner wants to hold another debt ceiling vote in six months because the GOP thinks these votes hurt the president. * Reid wants to push the debt ceiling off another two years for the exact same reason. This political wrangling has no economic purpose. But it does have an economic impact. The Dow fell by 200 points today and our debt rating is in jeopardy because, to all observers, our government has the same capacity for order and compromise of a kindergarten class left unattended with a bag of marshmallows. If you think another round of these painful fights in six months is an acceptable outcome in a weak economy, I would suggest that you watch more cable TV (for only this purpose!) to see how destructive the debt ceiling is in the hands of this government. Second, there is the balanced budget amendment. The GOP wants a vote on it, because it's a big, empty symbolic gesture to deficits that will ultimately be defeated in the Senate. The Democrats don't want to vote on it for the exact same reason. To understand why balanced budgets are impossible in the near future, consider that even Paul Ryan's ultra-conservative deficit plan leaves hundred-billion dollar deficits at the end of this decade. Bringing our deficits down to zero is neither desirable nor feasible. It's a pipe dream, a bill lacks both economic sanity and a chance of receiving a presidential signature. In other words, it would make for the perfect vote in this Congress. *The other reason that the GOP wants to hold a second round of spending cuts before the election is to use it as a platform to reduce entitlements. The White House offered Medicare and Social Security cuts in the grand bargain with Boehner two weeks ago. The Speaker declined over tax increases.